San Francisco in California, USA. Getting from the airport to Downtown San Francisco is a piece of cake on rail service BART, which runs from the airport every 15 minutes. The journey takes roughly 35 minutes and costs around $9 to Embarcadero (the sea port). The SFO BART Station is located on the Departures/Ticketing level of the airport. For a very compact city, there’s a huge number of transport options known as the ‘Muni’. Buy a multiple ride ticket for $16 (one day) to $31 (seven days) to access all transport. Or you must carry the exact change for a single ticket. • By bus 48 different bus routes run at least every 10 minutes from 5am to 1am. Stops are usually located every few blocks. • By metro The above-and-below-ground light rail runs on six different lines, every seven to 10 minutes, from 5am to 1am. • By streetcar or cable car A ride on one of these National Historic Landmarks is a must. They run every six to 15 minutes, 6am to 12am (streetcars) and 6:30am to 12am (cable cars). In peak times, 10am to 6pm, you may have to wait up to an hour for a ride! If you jump off mid-route on a cable car, you will need to pay a second fare to continue your journey. F-line streetcars offer hop-on/hop-off tickets valid for 90 minutes. • On yer bike! The city has plenty of bike lanes and panoramic vistas. 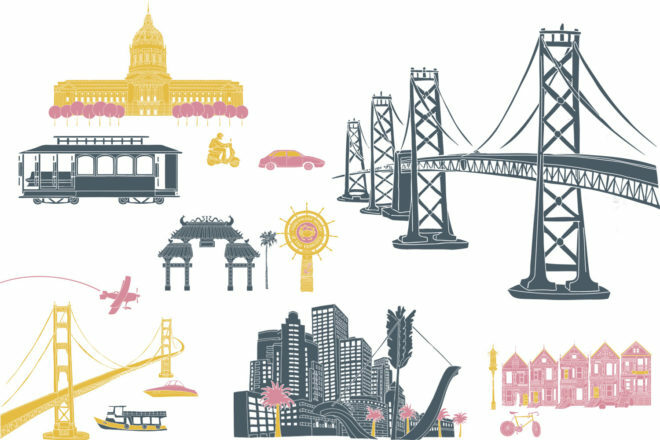 Cruise around San Francisco Bay, Embarcadero and Fisherman’s Wharf (4.8 kms), explore Golden Gate Park (14.5 kms) or cycle from Union Square to Golden Gate Bridge and take a ferry back to the city (25 kms; best to do this one early in the morning to avoid ferry queues). Visit sfmta.com for great walking and biking maps. Or join a tour (from $70 with Streets of San Francisco Bike Tours; sosfbiketours.com). The wild and rocky north-western corner of the city has a spectacular walking track that passes sprawling hillsides of wildflowers, pocket beaches and lookouts. We recommend taking the direction from China Beach to historic Cliffs House, where you can refuel with a bite to eat. Not really a secret, but the atmosphere at a baseball game is electric and the food is surprisingly good too. If you don’t feel like waiting in line for your Portobello mushroom sandwich, order a hotdog and beer from a vendor and watch as it’s passed down the line of fans to you! A wander through Chinatown is a must! But as well as popular Grant Avenue, head to alleyways like the gritty Spofford Alley at sundown, when the locals come out to play Mahjong. • Tartine Bakery & Café is a local favourite for sourdough. • 15 Romolo is a great Downtown bar for cocktails. • Park Tavern in North Beach is a chic tavern with a menu driven by market produce – and the best burgers! • Zero Zero serves up rustic wood-fired pizza, pastas and antipasti and is kid-friendly. • Hopwater Distribution has 31 Californian beers on tap and simple pub grub in North Beach. • Hidden Vine Wine Bar is a hip and moody watering hole in a back alcove near Union Square with its own bocce court available for hourly hire. • AQ in Downtown has a menu that’s updated each season along with its interiors. Yep, the colour scheme, décor, even fixtures are changed to match the season! Now that’s a dining experience. • Bluxome Street Winery is the (very divine) time-poor answer to Napa Valley. Go wine tasting right in SoMa. • San Francisco Antique and Design Mall is a treasure trove for antique lovers. • Treasure Island Flea Market supports local entrepreneurs selling fashion, upcycled goods, vintage and antiques and handmade wares. • Union Square is the place for big-name stores Barneys NY, Macy’s, Bloomingdales, Saks Fifth Avenue; designer threads from Chanel, Burberry, Prada, Vera Wang; and more affordable brands like bebe, GAP, Mango, Zara and Sephora. • Ferry Plaza Farmers’ Markets is worth a visit for fresh, local produce like a punnet of organic cherries, a jar of homemade chutney, a wheel of goat’s cheese. Or grab a freshly roasted coffee and simply enjoy the activity. All the city’s neighbourhoods are distinctive both in culture and charm. We suggest staying in the Downtown/Union Square area, a bustling shopping and cultural hotspot with designer and boutique stores, art galleries, cafés, bars and restaurants. It’s central to SoMa, Nob Hill, Chinatown and nearby North Beach, plus it’s a good base to get to Fisherman’s Wharf (19-minute cable car), AT&T Park (15-minute bus ride) and the ferry port to Alcatraz (20-minute bus ride). The Galleria Park is only blocks from Union Square, offering modern earthy-toned rooms brightened with pops of colour. There’s complimentary daily coffee/tea, newspaper and wine hour, plus a fitness centre and park terrace with a jogging track. This century-old hotel was re-imagined by interior king Philippe Starck and draws a hip, posh crowd with its black, ivory and steely grey scheme; hardwood, velvet and leather textures; eclectic furniture and hints of heritage Art Deco. The rooms are light and airy with lavender and neutral hues and smallish but sleek bathrooms. Enjoy a tipple at the iconic and glamorous Redwood Room, resplendent in its original redwood panelling. This vibrant and fun hotel is located in the SoMa district just steps from Union Square. It has spacious rooms with pillowtop beds, all things tech, walk-in showers, and modern décor, plus a one-of-a-kind antique Oriental rug. The Playroom bar is perfect for big kids – think pool, UNO, Connect Four, Nintendo, and the elegant Cavalier restaurant serves up British classics like fish ‘n’ chips. If it’s white glove service you’re after, this Renaissance-style hotel, originally built as a bank in 1926, will tug at your heartstrings. The service is first-class (impeccably dressed doormen, shoe shine, twice-daily housekeeping) and the interiors are ornate and timeless (crystal chandeliers, winding staircases, rich mahogany, marble flooring). Located right on the cable car line in the heart of Downtown, just a short walk from Union Square.